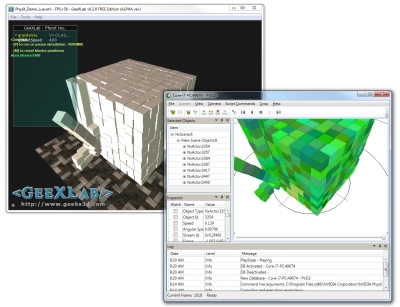 NVIDIA has release a new update of PhysX Visual Debugger (or PVD), the debugger for PhysX scenes. PVD 2.0.6 beta can be downloaded from PhysX Developer Support. Keep in mind that you can’t debug the first PhysX-based app you have with PVD. The PhysX application must have an instruction to connect itself to PVD. GeeXLab, for example, offers such a functionality. Just download the PhysX revolute joints demo for example, and add the HYP_PhysX.ConnectToVisualPhysXDebugger() instruction in the init script after the HYP_PhysX.StartEngine() function. Then start PVD, start GeeXLab, drop the demo in GeeXLab and you should see the PhysX scene in PVD. Lots of optimizations during capture! Capturing should be even quicker and more painless than it was with the first beta. Lots of UI bugfixing specifically to the tree views (All Objects, Selected Objects, Watched Objects). They should be more stable and much more user friendly especially when selecting new objects. Navigation and selection were reversed. So navigation is the default action while selection requires pressing ‘alt’. You can quick select something by double clicking on it without pressing ‘alt’. Reversed the log file direction. No more scrolling down; new errors at the top. New preferences dialog! Much easier to use, no tabs. Preliminary support for the 3.0 version PhysX!!!. We are very excited about this. Linux Programming: GDB Debugger for the Impatient (Tutorial)!